The initial question has been bothering me since I first saw it last evening ... because I wouldn't describe the outfit, or particularly the jacket, as being rustic at all. If I went out to the rural areas of East Texas, West Texas, Louisiana, up to Oklahoma or Kansas, up into the Midwest, or all the way out to New Mexico, I wouldn't expect to find anyone wearing that jacket. I expect the same would be true in southern California. It took me until this morning to come up with the correct adjective. The jacket seems retro, not rustic. I can't exactly peg down which decade, since it's before I started paying attention to fashion, but I think it might be a 1970's style pattern. As for my initial answer to the question, I looked at how casual vs. dressy the shirt and jacket are. They seem about equal in that regard. Being at the same level of casual/dressy is a good thing. Being retro ... well ... you're wearing a traditional kilt. A certain amount of retro is expected. The particular era of retro is a matter of personal taste. I'd certainly consider wearing a gingham shirt with a kilt and tweed jacket. I'm not sure that the necktie is working, though. My gut feeling is that the tie is competing with the rest of the outfit. I think you may be right. It was a new tie (to me) and I was excited to try it out but I may try to pair it with a plain shirt if I wear it again. For me, the overall colour of the jacket would not go amiss with the cilt, but the size of the check is too similar to that of the tartan and therefore, detracts from the latter. If the jacket were a plain colour, the shirt would be acceptable, but as you have already identified I believe, probably needs to a plain/solid colour to complement the cilt. Again, no criticism levelled, just observations (the jacket would also probably pair well with a pair of plain casual trousers/jeans). I though “no brown in town” applied to shoes? Anyway, can’t wear it with jeans, it’s cut too short. I often wear gingham with jeans/dress pants and a sport coat but I don't wear gingham with any of my more patterned jackets (houndstooth, plaid, etc) and tend to wear them with ones that are more textured. Similarly, with my more patterned jackets, I tend to wear solid colour or more subtle shirts as opposed to anything with more pattern. I would tend to apply the same rules when I wear a kilt and so I'd be tempted to pair a gingham shirt with one of my tweeds (none of them are checked). Alternatively, I'd pair that jacket with a less patterned shirt. I think you’re right. I’ve worn the same jacket with a plain light yellow shirt and simpler green tie and liked the results better. Please note that this photo is older and the jacket has been altered slightly since (sleeves and jacket shortened a little). Last edited by FossilHunter; 12th February 19 at 11:14 AM. I definetly prefer that combination. In the first photo there just seemed to be too much going on, i.e. too busy and confusing to the eye with so many different checked colours. I don't think there is anything wrong with the shirt and whilst the jacket isn't to my taste that doesn't mean it's wrong, after all I'm a electronics technician by trade, not a fashion designer. Last edited by Nomad; 12th February 19 at 12:19 PM. I see you've changed your sporran (a plain hunting and less ornate). That small touch seems to bring this new outfit together. 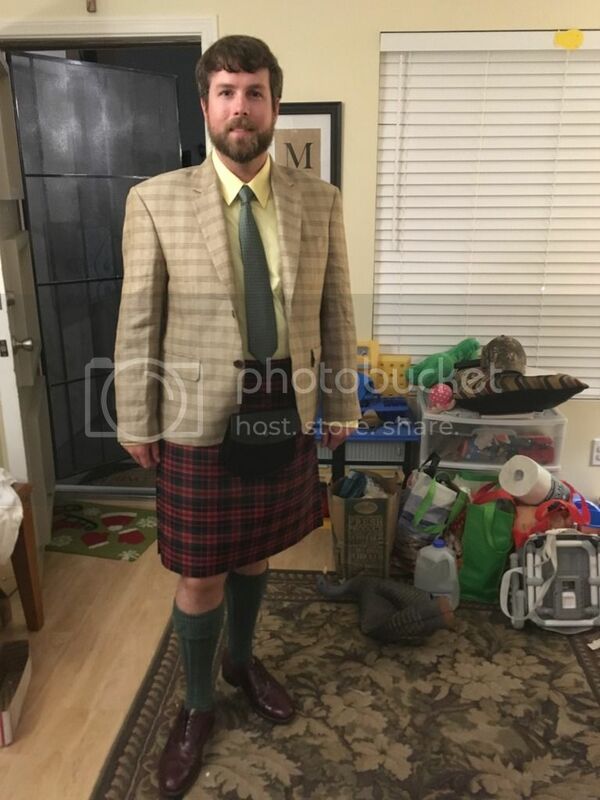 I'd suggest that you need to have the skirts cut away to accommodate the sporran in true kilt jacket style, and the sleeves shortened to fit properly, for this jacket to be in the ball park.